US President George W Bush has insisted the US is not in recession but says that he remains concerned about the economy's performance. The latest US unemployment figures - released on Friday - showed the number of people laid off last month at its highest for five years. 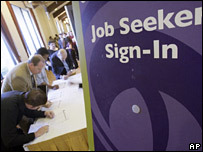 US employers cut 63,000 positions from their payrolls in February, Labor Department figures revealed. Mr Bush said he hoped consumer spending would "spur job creation". The Labor Department figures show the effect the housing and lending crisis is having on US firms, and follows 22,000 job cuts in January. Now Mr Bush hopes his $152bn stimulus package will give the economy momentum. Mr Bush is clearly worried enough about the state of his country's economy to be making statements to the media about it, the BBC's Matthew Price reports from New York. But many in America may be concluding that any economic help may come too late to have any real impact on what looks, every day, like an increasingly desperate situation, our correspondent adds. The package, recently passed by Congress, includes rebate cheques of $600 for individuals, $1,200 for couples, plus $300 each for dependent children for all but the very richest US citizens. "We expect they will use it to boost consumer spending and that will spur job creation as well," he said. Mr Bush had earlier said that "it's clear our economy has slowed". He added: "Losing a job is painful and I know Americans are concerned about our economy." "I know this is a difficult time for our economy," he said. "But we recognised the problem early and we provided the economy with a booster shot." Analysts had been expecting the US economy to create jobs in February and the fall will heighten recession fears. Manufacturing, construction and retail were hardest hit by job losses. The cuts swamped job creation elsewhere, including in education and health care, leisure and hospitality and by the government. Analysts highlighted that without a 38,000 increase in government jobs, the figures for February would have been even worse. "The most striking figure in the whole report is that private sector payrolls shrank by 101,000 last month compared to a modest 26,000 drop in January," said Paul Ashworth at Capital Economics. "A decline of that magnitude screams recession." Despite the drop in payroll employment, the unemployment rate fell to 4.8%, from 4.9%. The discrepancy results from the way the figures are calculated - 450,000 job seekers stopped looking for employment, so are not included in the calculation of the unemployment rate. Minutes before the report was released, the US Federal Reserve announced plans to make more money available to commercial lenders at its money auctions. The central bank hopes that if the big banks have easy access to funds, it will ease the credit crunch, which is making it more difficult for consumers and businesses to borrow money. The Fed said it will increase the amount of loans it will auction to banks on March 10 and March 24 to $50bn (£24.7bn), up from the $30bn originally planned. Analysts say that the central bank may also have to lower interest rates when its policy makers meet on 18 March. The Federal Reserve has already slashed rates to 3%, from 4.25% at the beginning of the year to stabilise the world's biggest economy. "The Fed is going to ease monetary policy - the question is how often and how fast," said David Resler, chief economist Nomura Securities International.